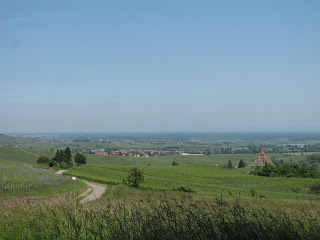 On Saturday, we decided to go walk part of the "Route de vins" in the Alsatian countryside. Although other regions of France are more widely known around the world for their wines (Bordeaux, anyone? ), Alsace can hold its own with certain grapes. The most well-known are the Riesling and Gewurztraminer varieties, but they also excel in the Pinot Gris, the Pinot Noir (which is more of a rose here), and their crémant, their version of champagne that contains mostly Pinot Blanc grapes. 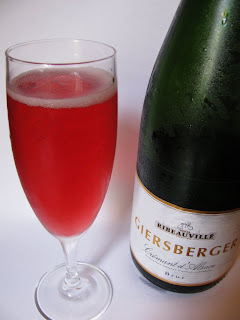 I know it may be sacreligious, but I actually prefer the slightly sweeter crémant to champagne. 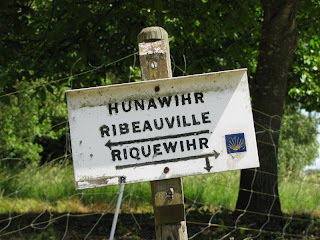 After a four kilometer trek through the vineyards between Riquewihr and Ribeauville via Hunawihr, we bought a bottle of crémant to celebrate when we got home from the Giersberger winery. We added a tiny bit of crème de cassis to make it a nice summery drink. Mmmm...I could get used to this life! 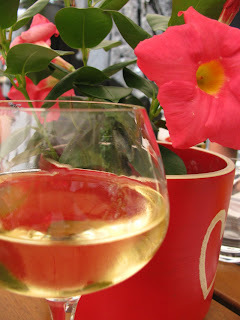 In France, it's common to have a little wine with lunch as well, and I've really enjoyed trying the different wines of the region. I think I've started a little love affair with the slightly sweet and light Pinot Gris. 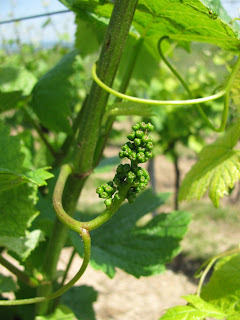 Although it was 90 degrees out, it is still spring here, so the vines aren't heavy with grapes quite yet...we only got a glimpse of baby grapes waiting to become delicious wine. So, next time you see an Alsatian wine on the shelf, you may want to check it out--it can be surprisingly tasty! Not a wine that I do not like, and we love Alsatian! Beautiful photos and I am jealous! But we about to sip on some Petit Sirah, Sanoma- I purchased last week, with our brisket tacos! Gorgeous. How I wish we were in France right now. Like Chef E, I've never met a wine I didn't like. I love sweet and light wines... I will pick up a bottle of the Alsatian wine the next time I go to the liquor store! Mindy you are so lucky to live there! I miss living in Europe. We lived outside of Heidelberg GE and loved it. ChefE--I'll have to try some of that when I get back to Ol' Kantuck and the Cali wines are cheaper than the French! Jen--Let me know how it goes! Robin Sue--Not too far from us, then! We love Heidelberg, and have visited several times this year. What a wonderful weekend outing! Gewurztraminer is my very favorite. I think I like the challenge of saying it too. Ha, ha! I loved your pics of Zurich by the way, beautiful!